The temperature in Nashville hit an all time record last Friday at 109°. The Europeans agreed last Friday that their permanent bailout fund, the €500 billion European Stability Mechanism, will be able to recapitalize banks directly, rather than loaning money to their host governments, provided there is set up a banking supervisory body overseen by the European Central Bank. As a result of this unexpected agreement, Spain and Italian government debt declined in yield, taking some pressure off those countries. After the 2.49% rally in the S & P 500 last Friday, the average declined 3.3% in the 2012 second quarter. CoreLogic (CLGX) increased its fiscal 2012 guidance based on higher than anticipated loan originations, successful completion of its cost reduction programs, and higher profitability in all of its business segments. The new estimate is for an adjusted E.P.S. of $1.15 to $1.2, up from the prior guidance of $1. to $1.05. I own two of the senior CoreLogic bonds maturing in 2028. My last purchase of that bond was made on a rare day that someone wanted to sell. Item # 1 Bought 1 CoreLogic 7.55% Senior Bond Maturing 4/1/2028 at 84.95 As explained in that post, this bond was trading infrequently before the issuer redeemed about 41M out of the 100M in principal amount outstanding. The relatively small amount left after that redemption contributes to the lack of liquidity. I checked the historical trades at FINRA which shows infrequent trading in small lots. There was $59.645M outstanding as of 3/31/12: Note 6 at page 12, CLGX-3.31.12-10Q. While that bond is also the underlying security in the trust certificate PJS, the bond provides a much better yield than the TC, though it is hard to trade. Both the TC and the underlying bond have a 7.55% coupon. Merrill Lynch Depositor Inc. PreferredPLUS 7.55% Trust Cert. Series FAR-1 for First American Corp (PJS) closed at $25.99 last Friday (par value=$25). I no longer own PJS, since the bond provided me with more-both a higher current yield and YTM: Bought PJS at 7.2-October 2008; Bought 50 PJS at 17.95 August 2009; Bought 50 PJS at $17.8 in Roth August 2009; Sold 50 of 300 PJS January 2010; Sold ALL PJS at 24.75 & 24.65 April 2010; Bought 50 PJS at 23.73 June 2010; Added: PJS at 24.72 October 2010; Bought 50 PJS @ 24.6 November 2010; Sold 100 PJS @ 25.2 May 2011; Sold Remaining PJS at 25.15-Roth IRA September 2011. Snapshots of the realized gains can be found at the end of Trust Certificates: New Gateway Post. 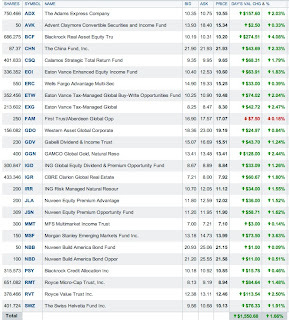 The 2010 transactions netted a $1,079.22 realized gain on 2011 shares (Roth IRA) and $1,000.18 in the taxable account. This bond was originally issued under the name First American. It is currently rated B1 by Moody's and B+ by S & P.
Three regional bank stocks that I own (ONB, CBU and FNB) crossed above their 200 day moving averages last Friday. Mike Pence, a republican Congressman running for Indiana's governor, compared the Supreme Court's decision on Obamacare to the terrorist attack on 9/11. While Mr. Pence later apologized for the remark, it does show his mind set as well as his many fellow travelers. After the Supreme Court's decision, Romney made his usual misrepresentations about this law. Lying works in politics, so why quit? For example, he stated that up to 20 million will lose their insurance, which they currently have and want to keep. PolitiFact rated that statement as false. Another statement was that Obamacare will add trillions to the deficits. PolitiFact requested the evidence supporting that claim from Romney's campaign who did not respond. PolitiFact rated that claim as false based on the CBO's projections. Romney also falsely claimed that Obamacare was a government takeover of healthcare. This statement has been repeatedly rated as false, and it won the PolitiFact lie of the year. FactCheck.org : ‘Government-Run’ Nonsense PolitiFact | PolitiFact's Lie of the Year: 'A government takeover of health care' Nothing will not stop GOP politicians from making that assertion. In fact, I heard Boehner make that same assertion last Friday on CBS News. CBS News Video. Truth telling must not be one of those conservative values. The top five lies about Obamacare are summarized at PolitiFact. After all, the Ninth Commandment only specifically prohibits giving false testimony against the neighbor and does not literally apply to statements about Obamacare when strictly construed and we all know how fond many are about strict construction, when it suits a purpose that is. I particularly like the part about liars burning in a fiery lake of sulfur. GOP politicians, all of whom profess frequently to being devout Christians and wish to post the Ten Commandments in Neon Lights in every government building, must believe that a lie becomes true when repeated over and over and over again. Besides, anyone who actually does a fact check can be dismissed as part of the mainstream liberal media who can be ignored after assigning that label to them. For anyone interested in what the law actually says and does, the Wikipedia section on the "Patient Protection and Affordable Care Act" and an outline by the Henry Kaiser Foundation are places to start. I would not rely on any politician's representation. It is possible to have legitimate reasons for opposing this law. But, misleading the public with a few catch phrases and bullet points are a far easier way to acquire and keep power, compared to debating the facts in an intelligent and honest manner. Romney says that he will keep the popular provisions of the law, such as compelling insurance companies to provide affordable coverage for pre-existing conditions. And, how is going to do that for those who are not already covered by employer plans? His previous solution was the adoption of the forerunner of Obamacare in Massachusetts (see PolitiFact comparison), and he knows that the GOP tribe members are virtually unanimous now in rejecting that kind of resolution even though it was originally a republican idea. 1. Sold 1 Norcraft 10.5% Second Lien Note Maturing in 2015 at 98.25 Last Wednesday (Junk Bond Ladder Strategy)(see Disclaimer): I bought this bond last March. Bought 1 Norcraft 10.5% Senior Second Lien Bond Maturing 12/15/2015 at 87 As it approached its par value, I decided to harvest a profit. To break-even on the junk bonds purchased pursuant to this strategy, I will need to trade some bonds for profits, while holding others purchased at a discount until maturity, just to break-even on the bonds. Given the high risks, I have already experienced several defaults (1 Reddy Ice, 2 EK, 1 AMR). As a Voyager customer, the Vanguard brokerage commission for this one bond purchase was $2. For some reason, the bond was not shown as available for purchase online. I knew that there was an active market so I called the Vanguard Bond Desk. I am charged the same commission for both broker assisted and online bond trades ($2 per bond). SEM close at $10.15 last Friday. 4. Sold 100 out of 501+ of CSQ AT $9.52 Last Wednesday (see Disclaimer): The discount to net asset value for CSQ has shrunk significantly. 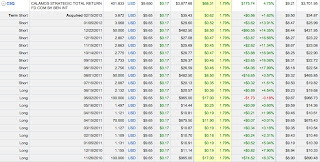 As of 6/27/12, the discount was -6.06 based on a net asset value of $10.07 and a closing price that day of $9.46. At the price that I sold shares, the discount would have been less than 6%. When buying and selling CEFs, I do pay attention to the average three year discount computed by Morningstar. The average discount over three years for CSQ is 11.95%. The primary purpose for owning this CEF is its income generation. I will pay attention to both the price and the discount when and if I decide to buy back those 100 shares. 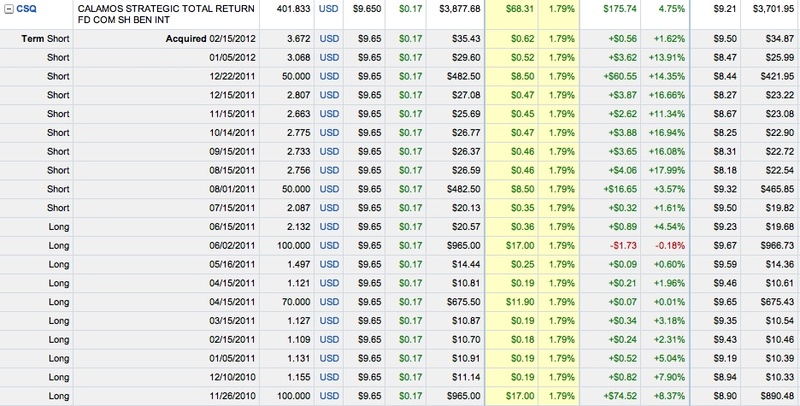 My average cost per share is $9.21 for my remaining shares. Before repurchasing those shares, I would like to see two conditions met. I would only want to buy when the discount exceeds 10% and the price is below my current average cost per share, preferably by at least 5%. Given the sheer number of securities that I own (over 400), it is difficult to keep track of this sort of plan for one security, but that would be the goal. If I did not write this blog, I would have the time to keep track of these details. This CEF is currently paying a monthly dividend of 7 cents per share. CSQ Distribution At that rate, the yield would be 9.1% at a total cost of $9.21. Calamos Strategic Total Return Fund (CSQ) rose 17 cents in trading last Friday to close at $9.65. 5. 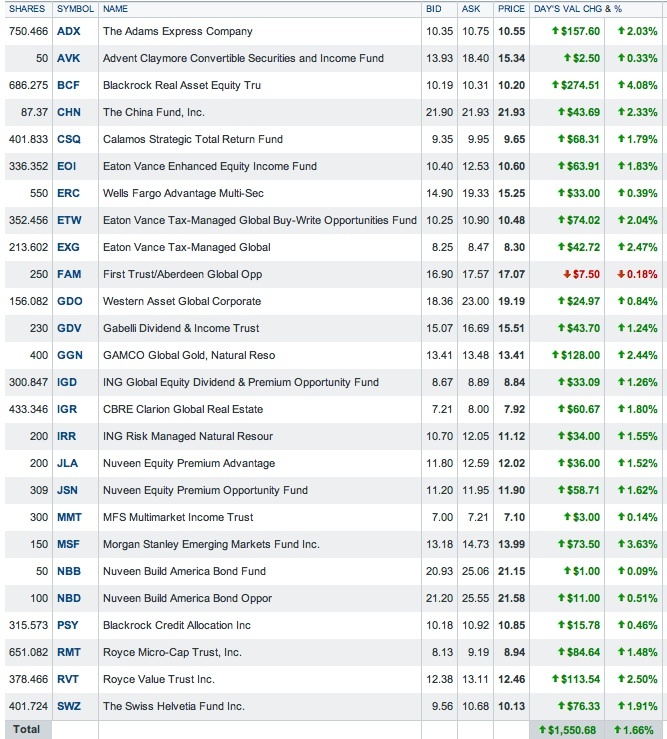 Closed End Fund Balanced Portfolio as of 6/29/12: With a few additions and subtractions since I last posted this table, I believe that the foregoing accurately reflects my CEF holdings. With these securities, I attempt to generate income, preferably on a monthly basis, and to create a world balanced portfolio.